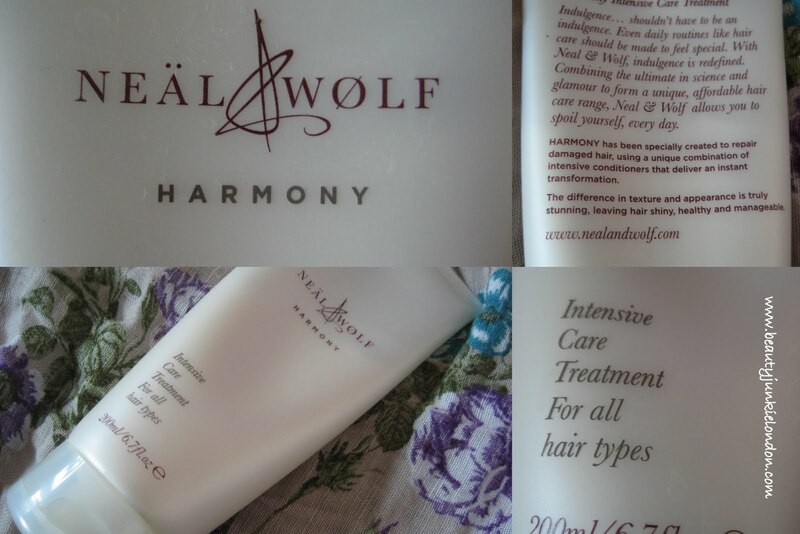 I was recently sent a couple of bits from the Neal and Wolf hair care range to try out and here are my thoughts on the intensive conditioner. Firstly, the packaging is lovely – it’s sleek and expensive looking and definitely looks like a luxury product. My only gripe with the packaging is the fact that there is a distinct lack of instructions. As a beauty junkie, I have used enough hair conditioners so that I had a pretty good idea of what I was doing with the conditioner. But I have also been trying a texturising lotion – this too has no instructions and I was left a bit stumped. In the past I have used texturising products that you put on wet hair, and on dry – so instructions would have been a big help in getting the best out of the product rather than making it a case of trial and error. There are instructions on the website, but I’m not sure that makes up for the lack of them on the packaging. Anyway, back to the product… my favorite thing about this conditioner is the scent. It smells gorgeous, slightly powdery/musky – this seems to be a bit of a trend with hair products at the moment, rather than the usual flowery scent. The smell manages to linger nicely on the hair too, which is really nice. The conditioner is creamy but not thick like many intensive treatments. It soaks in nicely to hair and rinses out easily – leaving hair clean feeling after a simple rinse. I found that straight away after first use my hair felt in fantastic condition and really silky, shiny and not at all weighed down. I do really like this conditioner, but (there is always a but…) I’m not sure I would consider this an intensive product. I have taken to using this pretty much daily and think it’s fantastic, but wouldn’t rely on it for more than daily conditioning. I haven’t tried the regular conditioner from the range, but would be interested to see how it differs and if it’s lighter or not? So if anyone has tried this, do comment and let me know what you thought. Overall, I really like this as a conditioner but as I have quite dry hair (with bleach highlights) I find I need something a bit more heavy duty for intensive conditioning – but daily, this is great for me and I love the smell. If you have normal/balanced, or greasy hair then this could be ideal for an ideal intense treatment. This product was sent free of charge for review purposes. All opinions are my own, honest and impartial. sounds like a pretty good product. especially since you noted that it doesn’t weigh your hair down. i have fairly thick, wavy/curly hair and i always found intensive treatments added too much weight. Aah, I’ve heard so many good things about Neal & Wolf products, I must try them at some point if only to smell them myself! Ooh I need a good conditioner, I have just recently started experimenting with them again as I grow my hair longer. Honestly can’t get enough of the smell of this conditioner! Love it!